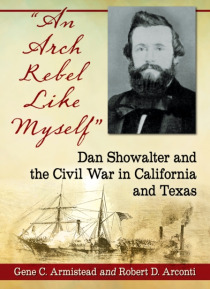 i Dan Showalter was Speaker Pro Tem of the California State Assembly at the outbreak of the Civil War and the exemplar of treason in the Far West among the pro-Union press. He gained notoriety as the survivor of California's last political (and actual, fatal) duel, for his role in the display of a Confederate flag in Sacramento, and for his imprisonment after an armed confrontation with Union … troops. Escaping to Texas, he distinguished himself in the Confederate service in naval battles and in pursuit of Comanche raiders. As commander of the 4th Arizona Cavalry, he helped recapture the Rio Grande Valley from the Union and defended Brownsville against a combined Union and Mexican force. Refusing to surrender at war's end, he fled to Mexico, where he died of a wound sustained in a drunken bar fight at age 35.